At the conclusion of Milestone #2, our team successfully planned and executed a series of diary studies that helped us better understand nine different individuals’ experiences while exercising, and afterwards created three project concepts using the findings collected. The diary study was preceded by a short questionnaire designed to help us gather quantitative information about our participant’s goals for exercising, perceived fitness level, perceived fitness education level, average amount of completed exercises in a given week, and gender. Their responses enabled us to categorize our users into two distinct categories: Novice and Expert. A diary study followed, lasting five days in total (Monday - Friday). Participants were provided with two sheets of questions: one to answer on exercise days and one for rest days. We asked them to read through the entire sheet of questions and answer them aloud while using their mobile device’s audio recording application to capture their responses. In total we received 29 recorded responses. Additional responses from those uncomfortable with using audio devices were sent via email; we received 10 responses via email. We analyzed the data collectively and from that synthesized our results into the eight distinct findings listed below. Most of our participants did not carry exercise clothes or accessories with them and decided to go home before exercising. Even though our sample size was small we feel that this was an important finding as it contradicted our original hypothesis that many participants prefer to go to exercise straight from work. The participants mentioned that they tried to do what activities they could each day, as they believed some form of workout was better than not working out at all. We used these findings, along with findings collected through interviews given in Milestone #1, to develop the three design storyboard concepts we created for this assignment which are: Jewel, Balance Shoe and Peripheral Motivation. Our participants were often distracted by social events, homework, and responsibilities. This was the most common reason for an unplanned rest day. Participants also had difficulty starting to exercise. In some cases, participants felt that getting some exercise, even if it was lower impact,was better than no exercise. We wanted to create a device that would help motivate our user when they were feeling demotivated. We started off with the idea of an external device that would know when you were home and would encourage you to exercise. However, it was important that this device was portable. The final version of Jewel is some kind of ear cuff, or ear piece. Based on the concept of Jane from the novel Speaker for the Dead, and J.A.R.V.I.S in the Iron Man movies, this small device would become a motivating friend who would remind users to exercise. Jewel could even banter with users trying to motivate users to do one more pull up or run 500 more feet, even when users feel tired. Our participants, both novice and expert, found that they often focused on form. However, novices expressed that they do not know which form is correct. The Balance Shoe would have four pressure sensors within the sole, two on either side, and one at both the toe and the heel. The FitFix Shoes would tie in with a wrist or body monitor of some kind. This monitor would let the shoes know what kind of activity is being performed. The shoes would then use the pressure sensors to tell if the activity is being performed correctly. For example,, if the pressure is elevated in the toe while doing squats, the shoe would know that the form is off. The shoe would vibrate slightly, and a corresponding phone application notification would pop up. The application would indicate how to correct the form (having ankles below knees). Users would feel better knowing how to do their exercises correctly, without hurting themselves or having an ineffective workout. In addition, the Balance Shoe could also tell runners if they are running pronated or supinated. Our participants found they were motivated by a social presence while exercising. Peripheral Motivation would be a touch screen that would stay at your home. It could also be synced as a computer, TV, or phone background. 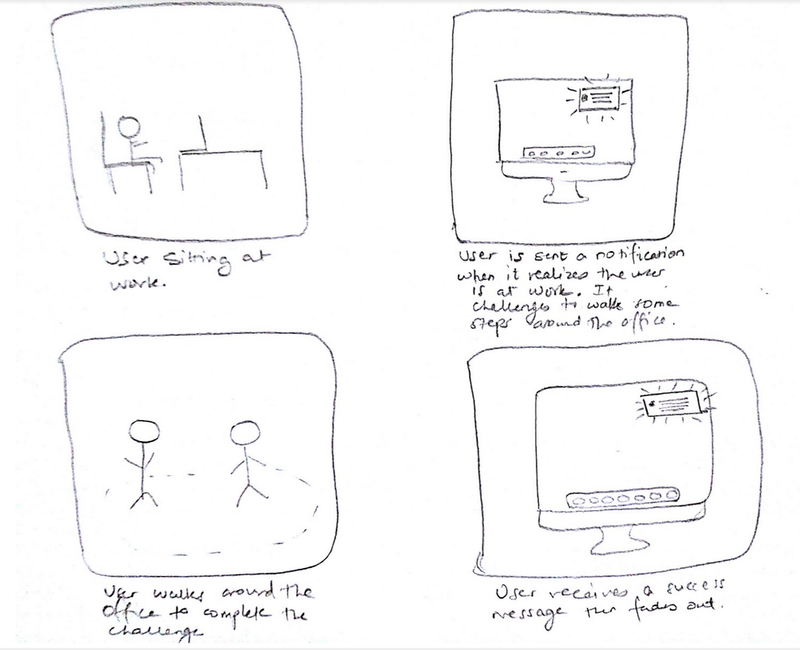 The Peripheral Motivation screen would visualize users’ personal and friends’ exercise throughout the day. If user’s friends were exercising a lot, their shape would increase in size. Users could press on a friend’s shape to see what kind of exercise they did, for how long, and where. Color saturation would be determined by the kind of exercise done. This piece would become a piece of art throughout the day, as people did exercises. Users could pick what “style” of art they would like to create on their peripheral media. What is the most effective way to motivate our users? What type of social interactions are most effective? What level of intrusiveness are our users comfortable with? Where are our users comfortable interacting with the proposed system? Peripheral "Journey across the country"
We wrote the initial scripts, scenarios, debriefing questions, and images/screens that would accompany each enactment. We tried the enactments on ourselves as a pilot and edited them to improve the flow of each enactment. All of our enactments were set in the home with the exception of the office scenario. The enactments took place in our users’ homes. We felt that this would be the most comfortable place for our users and would help them imagine how they could use these technologies within their own home environment. For the office scenario, we asked users to sit at a desk to simulate an office or work environment. The moderator read the scenarios and script to the user to describe the context in which the technology would initiate itself and prompt the user to exercise. In the case of Jewel, the moderator responded to the user as the voice of the technology. For the peripheral example, the moderator brought up predesigned screens on the user’s computer to simulate the notifications appearing on a peripheral device. In the case of the shoes, print outs were placed on the floor to simulate the wearable. After each enactment, we asked the users a series of questions to better understand how comfortable they were with the enactment scenario and its invasiveness, whether they found it motivating or not, and what they liked or disliked about the technology. Please see our study design for complete scenarios, scripts, and questions. Overall the most powerful aspect of the Jewel system is its ability to discreetly motivate the user. All of our participants liked that Jewel could be integrated with their calendars or TV and offer in-context fitness solutions, such as walking around the office a couple of times after a meeting or performing 20 pushups during a commercial break. Another successful aspect of Jewel was its ability to push the user to do more during their workouts - such as encouraging the wearer to do 2 extra push-ups to beat their personal record. The Jewel concept proved valuable to our participants on a motivational level. However our participants found the idea of Jewel being on their person at all times and in all situations discomforting. One participant bemoaned the aesthetics of Jewel by worrying it would look too much like a Bluetooth headset. Another was concerned Jewel would be too intrusive to use in a workplace setting. This user was concerned Jewel wouldn’t be “intelligent” enough to detect inappropriate times to suggest exercises, such as in the middle of a meeting or presentation. In this context Jewel might be seen as a distraction or annoyance, especially if inappropriate suggestions happen often. After discussing the Jewel findings as a group we concluded that it has potential with regards to the ways it can personally motivate and encourage its users. Our findings also show that this concept was successful in highlighting opportunities for fitness that might otherwise be overlooked. Our findings also suggest opportunities for rethinking the ways this motivational technology can be delivered based on the fact that our participants found wearing an earpiece at all times too intrusive. This concept proved the most successful compared to the other concepts. Of the three peripheral sub-concepts put forth by the team for this concept’s study, the “Oregon Trail (Periphery Task #2)” sub-concept was found a more valuable way to socially motivate users then the “Journey Across the Country (Periphery Task #1)” or “Competition (Periphery Task #3)” concepts. In general, all participants appreciated the way each sub-concept put their activity “in a real-world context.” This solution is contrary to how many popular systems display social activity through basic “step count totals” or “leaderboards”. One user remarked how he preferred the Oregon Trail sub-concept over the others because it favored collaboration between group members in contrast to the other sub-concepts which offered a more direct and competitive social experience. Although this concept had many positive results, some negative elements surfaced during our enactments. One is the “creepiness” factor of having the game linked to your GPS location at all times, a feature that would allow the game to launch itself whenever the user is nearby a device running the application. A second issue discovered was that this technology could consume a lot of electric power because it requires an electronic screen be on at all times. A final concern from our participants was that this system wouldn’t be contextually-aware of inappropriate times to turn on, such as during a party at the participant’s house, which could lead to privacy concerns if not executed properly. Our group ultimately feels like this periphery concept has the highest potential of the three for our final product. It was found to be a highly successful way of passively motivating users to achieve their daily fitness goals in a collaborative setting. Overall, the shoe concept was the least successful of our three concepts. Some participants found the feature which offered improvements to a runner’s gait useful, especially for runners who don’t quite know what they are doing, but weren’t fully able to grasp how this concept would truly enhance their run in the long-term. One participant remarked at how a shoe showing progress felt “redundant,” because they could almost as easily open a mobile running application and have access to that same information, plus much more. There were also issues of style involved. Some users were wary of what this system might look like if fully-realized and expressed concern over paying a lot of money for shoes that could potentially break down while in use. One user likened the concept to “children’s light-up shoes” and felt like he might get odd looks from those around him. This concept was the least motivating for our users. Most participants found the running form alerts useful, but all-in-all didn’t feel that the value was worth the potential cost of the shoes. After reviewing our findings, we looked at the overarching trends, and created criteria and tradeoffs. An overwhelming criterion for participants was that the technology not be “creepy” or invasive. However, every user had a different definition of creepy. Many users agreed that the TV turning on when you come home was unnerving, however, one user appreciated that it came on when he arrived. Also, some users found the idea of something speaking in your ear to be invasive, whereas others found the idea of a TV turning on to be more invasive. Regardless of how creepy users found the concept, all of the users appreciated the technology knowing their schedule and adjusting prompts to their daily routine. This meant that we had to find a tradeoff between schedule/GPS integration and the creepiness factor. When deciding upon our final solution, we kept in mind that people had different levels of “creepiness”. We tried to make features seen as “creepy” optional add-ins to the product instead of as primary feature. The findings around this tradeoff could be beneficial to any home-based design implementation. Even users comfortable and educated about the capabilities of their technology seem unnerved about the idea of their technology “knowing too much”. This finding also emphasizes a need for periphery-based integrations, rather than integrations that respond to users’ sensors. For example, when creating a home-alarm system, it could prompt users to complete tasks, such as turning on and off lights, rather than automatically completing them. We also found that an overwhelming portion of the participants valued a team-based approach to fitness. However, participants were concerned about playing with friends at a higher or lower fitness level. They feared that too large a gap between team members would demotivate them in the long run. Participants also feared that their friends may not participate in the game, but indicated that they may be interested in playing on their own if the story were interesting enough. We used these criteria to impact our final solution by focusing on a team-based game that “averaged out” the players’ scores. To elaborate, high-fitness level players would receive a higher-fitness level task than their lower-fitness level peers, for the same amount of points. In addition, the final solution would also work if you were just playing on your own. This finding could be beneficial to any design focused on creating team-based motivations. Participants liked when activity type and repetitions were specified. Participants did not like being told to “do something” with their exercise time because they felt it was too vague. In our final concept, we made sure to integrate a fitness plan with specific goals to help fulfill this criteria of the end user. This finding could be beneficial to any fitness-based design implementation.. The system we are proposing is a peripheral device that can exist in the living room of your house. To accompany this peripheral device we are also proposing some sort of companion application on the user’s phone or laptop/desktop background. This would show information in conjunction with the peripheral device. The peripheral device would be an optional screen display located in the user’s house which would show challenges and information throughout the day to help motivate them to work out. The screen would sync with their calendar to show challenges based on when users might be free, making this system context aware. This system also syncs with user’s wearables to provide added information. The system is context aware and also knows where the user is by using the phone’s GPS sensor. 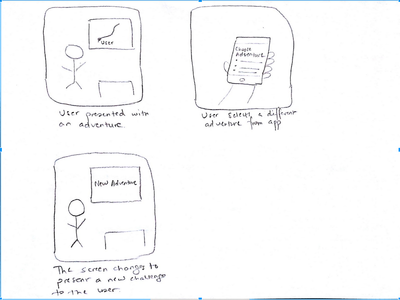 Challenges for users, or “adventure prompts,” would change in difficulty and type based on our users’ fitness levels as well as the location where the exercise is taking place. For example, gym challenges would be designed by personal trainers so that we engage our users in effective forms of exercise. Challenges taking place while at work or during rest days would be lower impact, focusing on walking around the office or home, and stretching at your desk. In addition, high-fitness level players would receive a more challenging task than their lower-fitness level peers, for the same amount of points. This would prevent users who are already more fit from leaving their peers behind. We are still uncertain about the specific story of the game that our users will play. Ideally, the users will be able to pick a storyline or topic that appeals to them; example story-lines include a historical game like “Oregon Trail”, a sci-fi adventure, or a deep sea exploration. Most of the features in this system revolve around the peripheral concept. Since most of our users that did the enactments did not want something as intrusive as Jewel and were more inclined towards the peripheral concept, our idea was to build something unobtrusive and sharing features with the periphery concept. . The technology to build this system exists as of right now. We imagine that this system can be built using displays and user’s current smartphone/wearables. By having the display sync with the user’s wearable and phone, we can make use of existing technologies such as WiFi and GPS. Also, with the use of APIs, we can have various devices communicate with each other. We believe that the system should not take more than 5 years to build. Gym and running “adventure prompts” are designed by personal trainers to provide effective and challenging workouts that include rest days. Work or rest days provide motivation for users to walk around or stretch (lower impact exercises). 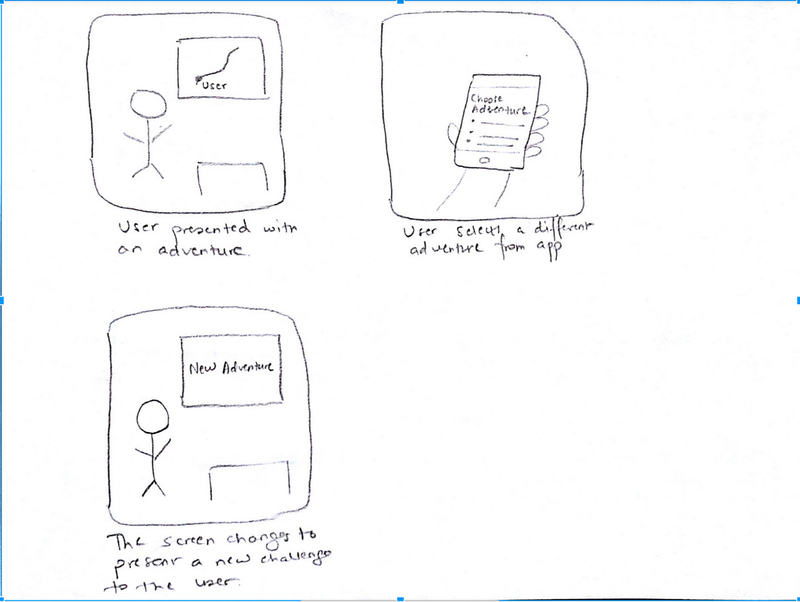 For our proposed location the system would be used, we will need to prototype the mobile and desktop screens that will notify and challenge our users. Our application will integrate with existing wearable devices (i.e. Fitbit, Fuelband, Up24, etc). Because the fitness wearable market is quite saturated, we feel that integrating with existing tracking systems will allow us to reach the most users. As part of our plan, we will need to simulate how our users will interact the system within the work environment, the home environment, and the gym environment. The demo will take place in the classroom at a table with his/her laptop. 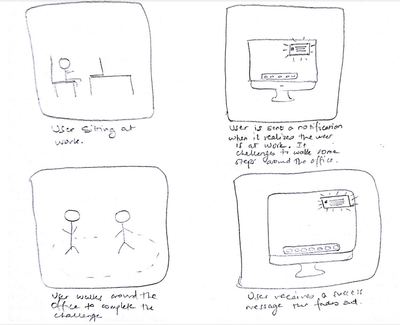 Ideally the user will be in an office environment. However, the classroom will still be a comparable space for the demo. Ideally our system will analyze the user’s calendar information to find open opportunities to notify the user of a challenge. These notifications will pop-up on the user’s laptop and smartphone. These will be lower effort challenges (ex. 1000 steps, 20 push-ups or squats) to gain energy points or food that will be useful for later challenges and to help the team. The challenge is verified using data from the wearable device. Steps can be accounted for by smartphone and/or wearable step tracking sensors. In addition, heart rate information can be used to verify calisthenic exercises. If the user does not have a heart rate monitor built into their wearable device, the user can use their camera through our mobile application to verify their workout. In our demo, we will be able to present the user with the appropriate screens; however, they will need to be manually moved to the next screen, since our prototype will not be tied to an existing device. In our demo video, we will be using an office or home office to accurately represent the space. The demo will take place in the classroom in order to maintain continuity between the different scenarios. Ideally our application will use GPS information to know when the user is at home. The device can also be connected to Netflix and other streaming applications, and use that information to refine the applications ability to find opportunities for exercise. The home challenges will be suited for the home environment and include steps and/or calisthenic workouts. Because we will not be integrating our application with these sensors and applications, these changes will have to be done manually. The mobile and desktop versions of our application will create a scenario of a storm approaching or an enemy to vanquish, and give the user a specific exercise or a series of exercises to complete the challenge. If each user on the team completes their goal, a bonus is given. We will present the user with the appropriate desktop and mobile screens in order to mimic this scenario. In our demo video, we will be using an apartment to accurately represent the space. The gym environment differs in that more difficult and longer exercise workouts will be given in order to challenge the users. 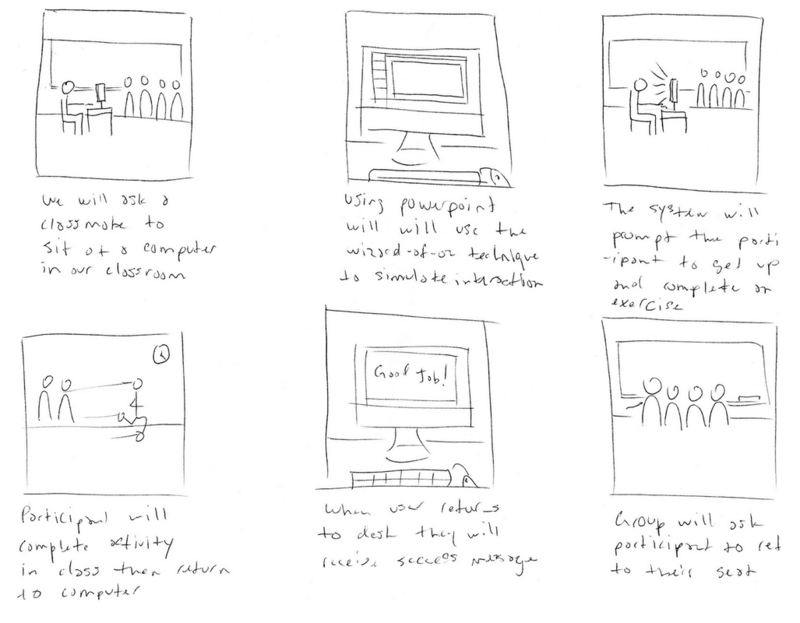 This will be the most difficult to mimic within a classroom setting for the classroom demo. Rewards for these challenges are better and can help the user and his/her team significantly. The user can either complete a workout created by the mobile application or complete their own personal workout. The wearable device uses heart rate and step information to quantify the user’s workout. Because this simulation is very similar to the home and work environment, we may not be able to complete the gym environment for the classroom demo. However, we will be able to create a more accurate representation of the gym environment with our video demo. These simulations will be very close to how it would work in the real world. Since we are developing a prototype, we will not be able to integrate into our users’ calendars, wearable device, or streaming applications. Because of this, we will not be able to pick the most opportune time to interrupt our users. However, the rewards and success screens will be developed and will mimic the actual experience the user would have. Because this simulation is very similar to the actual environment, we feel that the user will be able to get excited and be motivated to do more exercise.